Dr. Witkin in Plos Genetics 2012. I was thrilled to hear the news that Dr. Evelyn Witkin won this year’s Lasker Award for her pioneering work in DNA damage response. Witkin started out as a biology student at NYU; originally planning to continue on at NYU for her graduate work she was “bounced out of college” her senior year for her role in protesting NYU athletics’ acquiescence to segregation in the South. Fortunately, her move to Columbia and then Cold Spring Harbor Laboratory was a turning point in her career (mind you, NYU didn’t even have a genetics department). At CSHL, Witkin discovered a strain of bacteria that was immune to the damaging effects of UV radiation. This was the starting point for understanding the molecular pathways that regulate DNA damage and repair (which so often go haywire in cancer). I first contacted Witkin in 2013, while I was trying to dig up information about another CSHL alum, Martha Chase. While Martha remained elusive, I got a broader sense of what it was like to be a female scientist at CSHL in the 40s and 50s (surprisingly good by her account). On top of being a top-notch scientist, it was evident from my correspondence with her that Witkin is a remarkably kind, I’d say graceful, person. I’ve included an email from her below to give you an idea. I remember Martha Chase very well, as an attractive young woman who worked with Al Hershey, but I’m afraid I will have to disappoint you when I tell you that I really did not know her very well. I don’t recall ever talking with her about the work she was doing with Al, either before or after the publication of their 1952 paper. We exchanged smiles and greetings when our paths crossed, which somehow did not happen very often. Perhaps that was because by 1952, I was no longer living on the grounds at the lab, but across the harbor in CSH village. I appreciate your interest in what CSH was like in the forties and fifties. I will try to answer your specific questions as soon as I can, but it occurred to me that you might want to read my memoir Chances and Choices: Cold Spring Harbor 1944-1955, which was published in 2002 in the Annual Review of Microbiology. I have attached it here. Perhaps you will find some of your questions answered there. After you have had a chance to read it, it might be useful for you to send me an amended list of questions, which I will then be glad to answer as best I can. I have to call your attention to an error in that article, which I discovered only after it was published. In the list of future Nobel laureates that I met at CSH. I mistakenly included O.T. Avery, C. M. McCleod and M. McCarty. I has assumed that the prize had been awarded to them, and was shocked to learn, that it had not. I’m sure that you must be having a wonderful experience in your graduate work in 2013. Whenever I visit, I sense that a lot of the magic that I remember is still there, on steroids. Thank you for writing, Kristen. Let’s keep in touch. Monday and Tuesday marked the 26th annual Cold Spring Harbor In-House Symposium when the lab community comes together to hear research updates from half of the faculty. As corny as it sounds, I think that the couple days before leaving to spend Thanksgiving with family is the perfect time to celebrate the scientific progress of our colleagues. During last night’s banquet, as we gathered around to hear David Spector’s Symposium top ten list, there was a palpable sense of gratitude. It’s a tradition I’ll miss when I leave CSHL. Anyway, I was the chair for Tuesday’s morning session, and had to scramble for something creative to do for my introductions. Swinging away from the previous day’s “roast” I decided (for some reason) to do haikus. Here they are for the speakers; you can click on the photos to read about each lab’s research. So what is the nerve gas, sarin, and what makes it so deadly? Space-filling model and line structure of sarin. Sarin is an organic compound that contains a carbon-phosophorous bond. Compounds like it are often used as insecticides and are extremely potent blockers of communication between nerves and organs. Sarin, and other nerve agents implicated in the Damascus attacks (tabun, soman, and VX) block communication between nerves and organs by allowing the build up of a neurotransmitter called acetylcholine. Normally, an enzyme called acetylcholinesterase rapidly breaks down acetylcholine after it’s been released from a nerve ending. At the junction between nerve and muscle acetylcholinesterase works as a sort of “on-off switch” for muscle contraction. When acetylcholine is released from a nerve cell it binds to receptors on muscle and makes it contract. Normally, acetylcholine molecules are kicked off of the muscle receptors and broken down by acetylcholinesterase, allowing the muscle to relax until the next incoming nerve impulse releases acetylcholine. Sarin breaks this on-off switch by attaching itself to acetylcholinesterase, blocking its ability to break down acetylcholine. This allows it to build up in the space between the nerve and muscle and continuously stimulate muscle, leading to spasms and eventual paralysis. The same process simultaneously takes place at nerve-nerve cell junctions throughout the body: salivary glands are overactivated, causing hyper salivation and mouth-foaming; pupils constrict, impairing vision; and bronchial tubes squeeze shut, suffocating the victim. Sarin is devastatingly effective, and its symptoms line up with those reported for hundreds* of people in the Damascus suburbs. For a short while, before supplies ran out, the victims were administered an antidote to sarin, called atropine. Atropine acts by competing with acetylcholine for binding to receptors on the muscle (or other nerve cell), while not activating the muscle or nerve cell itself. This gives the muscles and nerve cells relief from stimulation. Atropine blocks acetylcholine from binding to muscle or other nerve cell receptors. Acetycholinesterase enzyme, shown right, is inactivated by sarin binding. Unfortunately even if atropine is administered, sarin – particularly its effects on breathing – can have longterm negative consequences on brain function. There are fears that current atropine supplies are very limited, and that any existing stockpiles are likely controlled by the Syrian military. Secretary of State of John Kerry has condemned the attacks as a “moral obscenity“, and the Los Angeles Times reports that Kerry’s emotional language may be an attempt to “build up public support for a muscular attack” on Assad’s forces. 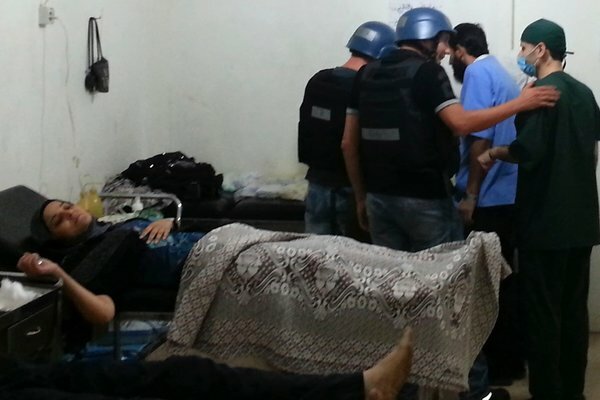 NYTimes reports death toll was so high because rockets delivered large payloads of sarin gas. Since I can remember, summers for me meant the shore. When my siblings and I weren’t playing leap frog with the waves or making drizzle sand towers, we patrolled the beach. We buried the jellyfish that washed up on shore, lest anyone fall victim to an ill-placed foot. We picked up stray trash so that it wouldn’t hurt animals like those 6-pack rings did. My favorite duty, however, was gingerly righting the horseshoe crabs that had the misfortune of winding up on their backs. Looking like a primordial holdover, the horseshoe crab easily evoked my sympathies. It reminded me of The Little House: sturdily built to last the ages, it was made to look lumbering by the civilization that sprung up around it. And to think 300 million years ago it was the dominant creature on the planet. Further proof they get no respect: they aren’t even crabs! The horseshoe crab is an arthropod that’s more closely related to spiders or scorpions than any of the crustaceans. My grandma’s house sits on the southern tip of New Jersey on the Delaware Bay, which happens to be prime breeding ground for the horseshoe crab. Every year as my family descended on the beach on the bay, the horseshoe crabs came to mate and lay their pearly green eggs. When horseshoe crabs emerge from the surf and slowly traverse the sand, their legs remain hidden from view beneath their shells. It gives them the appearance of helmets commandeered by stowaways (like the old cartoon bucket or traffic cone shtick). I remember crouching down close to them, squinting hard to see if I could make out an eyeball where the bump on the shell suggested one would be (they actually have 10). Often one would sit so still, I’d be sure it was a once-but-no-longer “living fossil”, when suddenly it would lurch forward. When they were on their backs, however, the difference between life and death was stark: they were either an empty plate where a seagull’s dinner used to be or a frenzy of legs. The horseshoe crab’s tail can prop itself up, helping the wake to flip it over. Farther from shore, a little human intervention goes a long way. The more pressing issue for the horseshoe crabs, and the migratory birds who rely on their eggs to fuel their journey, is how many make it ashore to spawn. Starting in the 90s, the number of horseshoe crabs began to dwindle, triggered by their use as bait for eel and conch that was sold for sushi. This period of decline went largely unnoticed by my siblings and me (NJ declared a moratorium on harvesting them in 2006). We were growing up; we spent less of our summer at the shore, and we simply didn’t look out for them the way that we used to. I miss the days when I saw myself as the horseshoe crab’s protector, when the only problem that needed to be solved was what lay – bottom’s up – in front of me. Anyway, I’d had it wrong: I was under the horseshoe crab’s protection. Most of us are. The horseshoe crab is something of a court taster in the biomedical industry. Which is rather funny considering it’s the real blue blood. In the Middle Ages, the court taster’s job was to intercept poisoned food before it was served to his lord. We may not worry about hemlock or foxglove nowadays, but injectable drugs and implanted devices (e.g. pacemakers) threaten to serve up a different kind of poison, called endotoxin. Endotoxin is a molecule that decorates the outer surface of gram-negative bacteria, so named because they don’t stain purple in the Gram bacteria identification test. Since the advent of the hypodermic needle, endotoxin has been a headache for the pharmaceutical industry. In the late 19th century, doctors noticed that injecting sterile drugs still caused some people to develop “injection fever”. What they didn’t know at the time is that even if the bacteria is killed, the remnants of its outer membrane – including endotoxin – can stick around. Injection fever, and in the most extreme case sepsis, isn’t actually caused by something that the bacteria does to our body. It’s our body’s immune response to the endotoxin that can prove deadly (read more about sepsis in Maryn McKenna’s SA article). Because they can’t filter endotoxin or heat-kill its fever causing effect, pharmaceutical companies need to ensure that it isn’t there in the first place. This is where they defer to the horseshoe crab. The horseshoe crab “taste test” depends on a remarkable extract of its powder blue blood called Limulus amoebocyte lysate, or LAL. 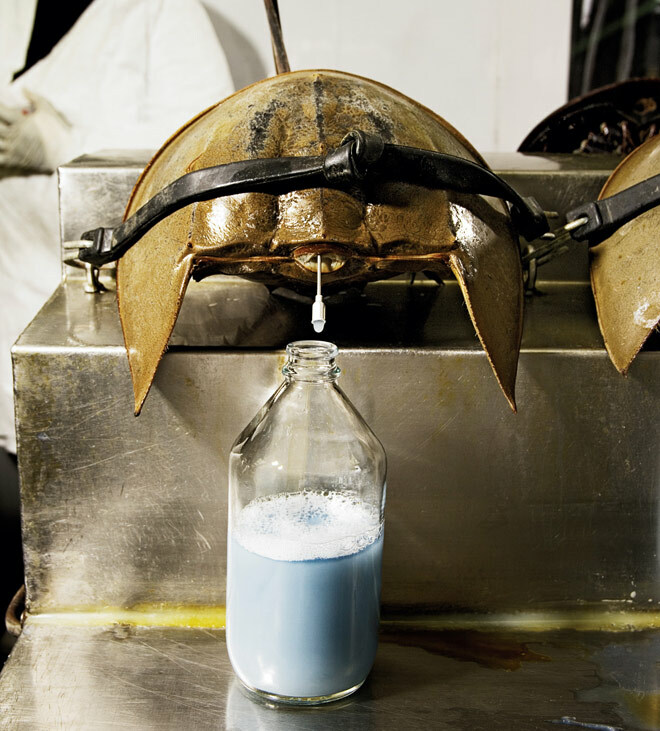 What makes LAL such a sensitive test – and worth its whopping $15,000 price tag per quart – is that horseshoe crabs know our potential poisoner very well. In fact, they’ve been locked in battle with gram-negative bacteria for millions of years. In its oceanic home, the horseshoe crab is constantly under threat of bacterial invasion. It also has a relatively open circulatory system that allows blood to directly contact large areas of tissue. Taken together, it would be easy to imagine how a minor crack in its shell could give bacteria easy access to tissue, spelling out disaster for the horseshoe crab. Luckily horseshoe crabs have evolved a type of immune cell that senses when bacteria is present in the blood. It knows this by gram-negative bacteria’s calling card – endotoxin. When the horseshoe crab’s immune cells, called amoebocytes, detect endotoxin they swarm the bacteria, releasing clotting agents that stop up breaches in the shell and trap bacteria. Once the bacteria is sequestered, amoebocytes release killer proteins. The LAL used in the lab is the clotting agent collected by lysing, or rupturing, the amoebocytes. The LAL is freeze-dried in powder form, and gets reconstituted in endotoxin-free water when it’s time to test a sample. If endotoxin is present, the sample becomes a gel, and the drug batch or device gets flagged as contaminated. Amoebocytes respond to endotoxin in Bang’s 1956 paper. This unique property of horseshoe crab blood was observed by Dr. Fred Bang in the 1950s. He infected several horseshoe crabs with a gram-negative bacteria from sea water. He noticed that one in particular became sluggish and looked ill. On inspecting the dead horseshoe crab, Bang was surprised to discover that almost its entire blood volume had become a gel. He went on to show that this clotting effect was triggered by endotoxin and carried out by amoebocytes. Today, producing LAL is a $50 million industry. Companies capture horseshoe crabs and bring them back to the laboratory where they collect up to 30% of their blood. The horseshoe crabs are released back into the wild within 72 hours, and figures suggest that as many as 10-15% of horseshoe crabs die following collection. Flipping over horseshoe crabs won’t ensure their future, but that doesn’t mean that we can’t act as their protectors. After hundreds of million of years on this planet, their survival depends on the preservation of their spawning habitat and the regulation of their harvesting. The public’s awareness of the horseshoe crab’s life-saving contribution is an important piece of the puzzle. Remember that the same horseshoe crab that looks so helpless on its back might have saved your life. Return the favor. Hurricane Sandy posed the latest challenge to horseshoe crab spawning, as it stripped them of up to 70% of their mating habitat. After negotiating the man-made barriers of debris, the crabs would be met with thick clay and vegetation where there had once been sand. Fortunately, environmental agencies stepped in to replace sand on breeding grounds ahead of the arrival of the crabs and birds. However, the long term impact of habitat destruction remains to be seen. McKenna, M. Researchers Struggle to Develop New Treatments for Sepsis. Scientific American. Solon, O. Annual Blood Harvest of the Horseshoe Crab. Wired. A Waring blender, similar to the one used by Hershey and Chase. It started with a blender. A Waring blender, to be exact. The thing is, until a retro green model caught my eye in a kitchen store, I’d never seen one. I’d heard the name years before in a high school classroom in the context of bacteria, protein, and DNA. It was the brand used in the Hershey-Chase blender experiment that convinced scientists in the early 50’s that DNA, not protein, was the molecule of heredity. As a high schooler, I had no clue what a real-life research lab was like, and when I heard “Waring blender” in a breathless phrase, I pictured something industrial-grade, special. It didn’t occur to me that in 1952, while Alfred Hershey and Martha Chase agitated bacteria, people were making Mai Tais with the same appliance. As a graduate student at Cold Spring Harbor Laboratory (CSHL), the very place Hershey and Chase performed the blender experiment, I’ve come to know that scientists are a scrappy, resourceful bunch. We use what works, and the mundane blender at the center of the famous experiment did exactly what Hershey hoped it would. Back in 1952, “genes” weren’t synonymous with DNA. Genetic information was thought of as the material that enabled an organism to reproduce, but it was still controversial as to what that material was. Experiments by Avery, MacLeod, and McCarty at Rockefeller University in 1944 provided evidence that this material was DNA, but they faced considerable resistance from the scientific community. Hershey himself favored the theory that proteins, with their more complex forms, harbored genetic information. When Hershey and Chase set out to conduct an experiment that could settle this issue once and for all, Hershey probably had in mind disproving the Avery-MacLeod-McCarty result. However, the blender experiment results proved to be a “mental shock” that rocked Hershey’s views. Once the careful experimentalist convinced himself that DNA was the molecule of heredity, he convinced the world. The simple viral-host system of T2 bacteriophage and E. coli was the perfect battleground on which to pit the protein theory of heredity against its DNA competitor. The reason being that T2 phage is made up of only two parts: a protein coat and the DNA contained therein. Just months before the blender experiment, electron micrographs taken by Thomas Anderson showed that phage never invades bacteria as a whole: it always remains attached at the surface. Some part of the phage – either its DNA or certain proteins – must enter the bacterium in order to hijack its cellular machinery and produce new virus. In an experiment many biologists would gladly give their pipetting arm to have designed, Hershey and Chase tracked the location of T2 phage DNA during its hostile takeover of E. coli by tagging it with a radioactive form of phosphorous. DNA contains vastly greater amounts of phosphorous compared to protein, so the presence of high levels of radiation would give away phage DNA’s location. Hershey and Chase wanted the tagged phage to infect bacteria, but they didn’t want it to stick around at the surface – they only cared about what the phage transferred to the bacterium during the initial stage of infection. This is where the Waring blender got its chance to shine. The blender wasn’t their first choice for removing phage from the outside of bacteria. According to Hershey, “We tried various grinding arrangements, with results that weren’t very encouraging”. It was only after a fellow CSHL geneticist, Margaret McDonald, offered her blender that the experiments started to work. The Waring blender had just the right amount of shearing force to remove phage coats from the bacterial walls, without rupturing the bacteria completely. They then spun the bacteria/phage smoothie in a centrifuge to separate infected bacteria from everything else: bacteria formed a pellet at the bottom of the tube, while everything that was smaller (including protein coats) stayed in the liquid above it. Upon measuring radioactive phosphorous, Hershey and Chase found that only bacteria showed high levels of radiation. DNA made it into the bacteria, protein didn’t. Most importantly, phage were able to replicate in bacteria even when their protein coats were kicked off soon after infection. 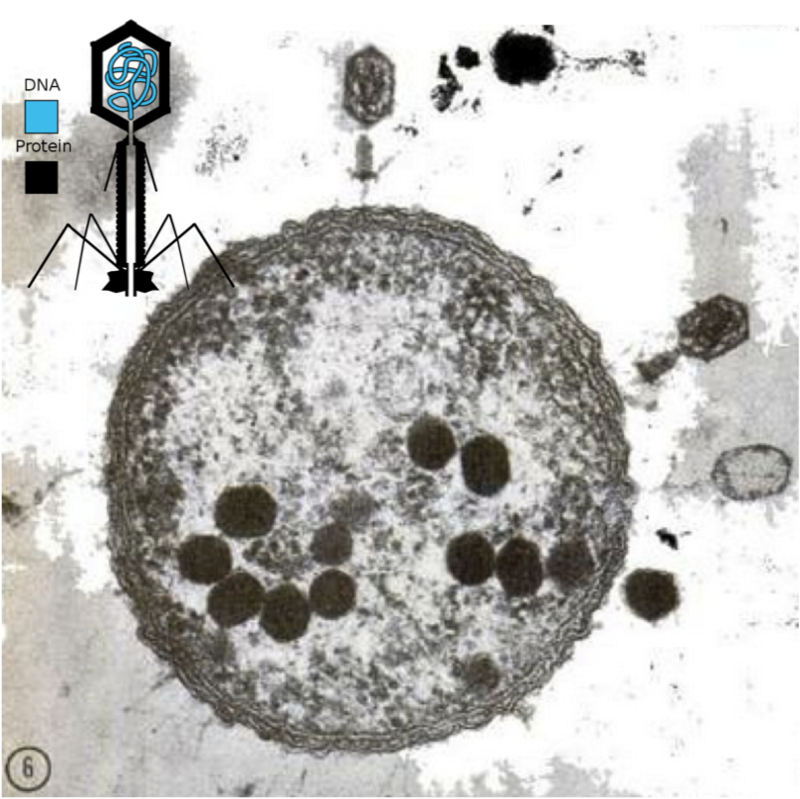 It looked like protein itself wasn’t necessary for phage reproduction after all. It might just serve as a passive vehicle to get the genetic material into the cell. At first, Hershey thought there must be a mistake. After presenting the blender experiment results in a staff meeting, a young scientist named Waclaw Szybalski recalled Hershey said, “I don’t believe in that DNA”. Meanwhile, Barbara McClintock thought it was a nice experiment. I’ve been thinking – and perhaps you have been too – that the virus may act like a little hypodermic needle full of transforming principles; that only the tail [of the virus] contacts the host and perhaps [sic] cuts a small hole through the outer membrane and then the nucleic acid of the virus head flows into the cell. Hershey and Chase repeated their experiment, only this time they tagged the phage protein by radiolabeling an element found only in protein: sulfur. They found the exact opposite result: radiation was found in the liquid portion that contained the protein coats and not in the bacteria. Again, the virus was able to replicate in the bacteria cells after blending had removed protein coats from the cell walls. Further experiments showed that phage offspring contain radioactive phosphorous passed down from the tagged parental phage. Virtually no radioactive phosphorous is found in the protein of viral replicates. This finding further solidified the notion that DNA was the genetic material responsible for reproduction. This post is a result of a CSHL tour I gave to a high school class this week. The teacher asked me in which building Hershey and Chase performed their blender experiment. I took a safe guess at McClintock Laboratory, which back in the day was the animal house. While correct, it made me want to refresh my memory of the experiment. As a working scientist, I have a much greater appreciation for its simplicity and elegance than I could at 15. Just as I naively took “Waring blender” to be a single entity, I saw an equal scientific partnership in the symmetry of the “Hershey-Chase” experiment’s name. Instead, Martha Chase was Hershey’s young lab technician. Hershey wrote that the two were “groping toward the idea of the blender experiment” in 1951, implying that she did aid in the experiment’s design. However, I have yet to find any account of the work in Martha’s own words. While Hershey went on to win the Nobel Prize in 1969 with other Phage Group pioneers, Max Delbruck and Salvador Luria, Martha’s life took a more tragic trajectory. In my reading I came across a post on a blog about the scientist Linus Pauling called “The Martha Chase Effect.” The author found that while their blog was dedicated to the life and work of Linus Pauling, the search term that most frequently brought people to the site was, “Martha Chase”. This is because Chase’s digital footprint, particularly for images, “represents a much smaller body of water” than Pauling’s. In a future post, I hope to explore the “Martha Chase Effect” and learn more about the young woman whose name is forever eponymous with the Waring blender experiment. 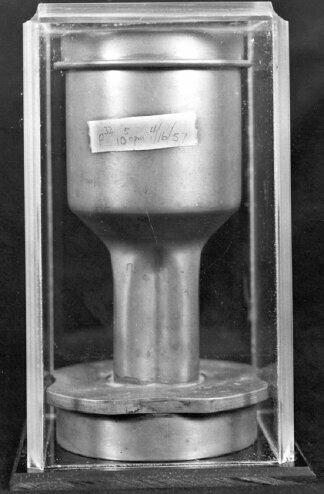 Take a gander at the actual blender used in the experiment: not as sleek as the one I showed (notice the warning label for radioactive P32). Thanks to Matthew Cobb for the link! Thanks to The Linus Pauling blog, for background information and inspiration for the Martha Chase Effect. “A Phage Shows its Claws” by Lee Simon in New Scientist and Science Journal, 1971. “The Injection of DNA into Cells by Phage” by A.D. Hershey from Phage and the Origin of Molecular Biology CSHL Press. “Martha Chase Dies” by Milly Dawson in The Scientist Aug 20, 2003. 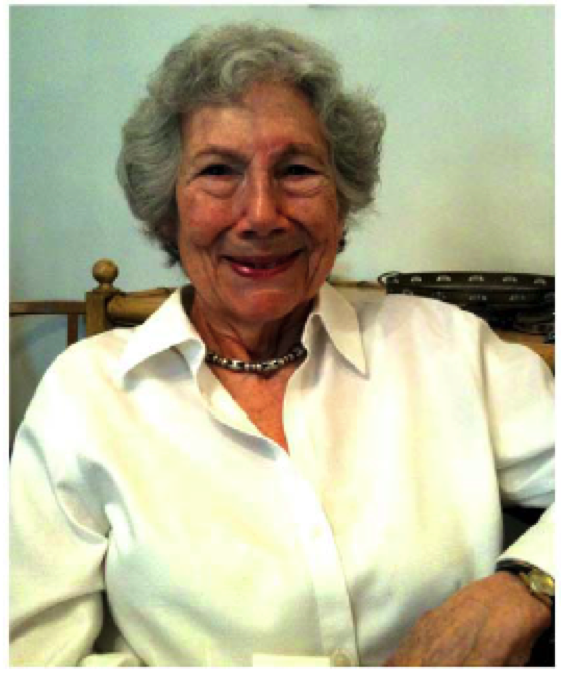 CSHL Oral Histories: Waclaw Szybalski on Martha Chase. 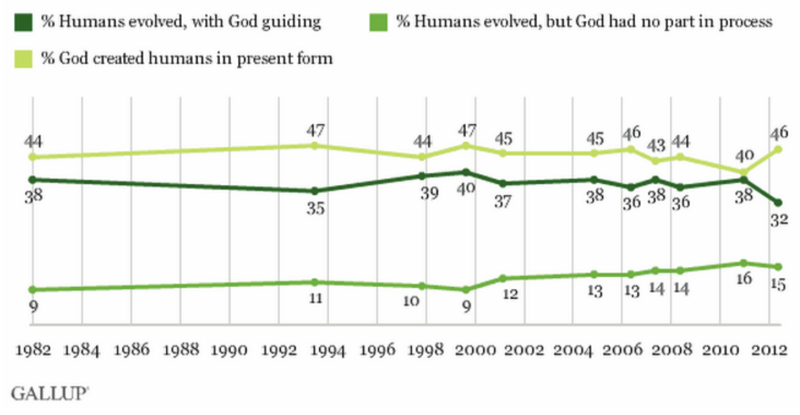 Nearly half of Americans believe that humans were created in their present form by God within the past 10,000 years. The percentage of Americans who hold a hard-line Creationist view of the world has been flat for the past 30 years, despite major the gains science has made in understanding our human origin, including sequencing of the human and chimp genomes. The mounting scientific evidence that humans and chimps evolved from a common ancestor ~5-7 million years ago has failed to make those data points budge. Consequently, Americans still debate what place human evolution has in the classroom. Similarly, evidence of a 150-year trend in rising global temperatures hasn’t stopped people from pointing to a cold winter’s day as a refutation of climate change. The public policy that will determine what we teach our kids and how we deal with climate change will hinge on whether or not voters understand the scientific method, or at least value scientific evidence. Scientists can’t afford to discuss amongst themselves and grumble about how the public doesn’t get it. Fortunately, if the attendance at Carl Zimmer’s writing workshop is any indication, scientists are looking to add their voices to the public discourse. If not to increase science literacy then, heck, to at least share the exciting things happening in their labs with family and friends. Scientists can chip in to cover “all the amazing papers”, lest Ed Yong sends himself to an early grave. So great, we have scientists who are onboard and want to deliver science to the public. One problem: scientists, we’re told, are pretty bad at communicating science. It was sometimes almost sweet, how incompetent they were- how unable to offer a clear, logical account of their work that would be understandable and interesting to an intelligent layperson. I read this passage on the eve of the writing workshop. It fell under the subheader “Don’t Be Afraid” and it was aimed at convincing science journalists that they shouldn’t be intimidated by egg-headed scientists. As an egg-headed scientist it left me feeling, well, intimidated at the prospect of a professional writer ever reading my own attempts at science writing. But here was acclaimed science writer Carl Zimmer telling us that we too could learn to be effective writers. It would just require a bit of “deprogramming”. The thing is, scientists sometimes forget to speak English. As students we put in a lot of effort to learn the scientific language, or jargon, of our fields – terms like “synaptic plasticity” or “epigenetics” encapsulate a textbook worth of material. We embraced jargon because we earned the right to use it, and as Zimmer said it, we wanted to “sound like the grownups”. Jargon is super convenient when experts wish to convey concepts quickly among themselves, but it’s also a sure-fire way to make the eyes of non-scientists glaze over faster than you can say “Krispy Kreme”. First and foremost, scientists need to dispense with scientific lingo when they write for the public. Some jargon is easy to spot, like “RNA interference”. However, scientists sometimes have “jargony” uses for everyday English words that are confusing to lay readers. 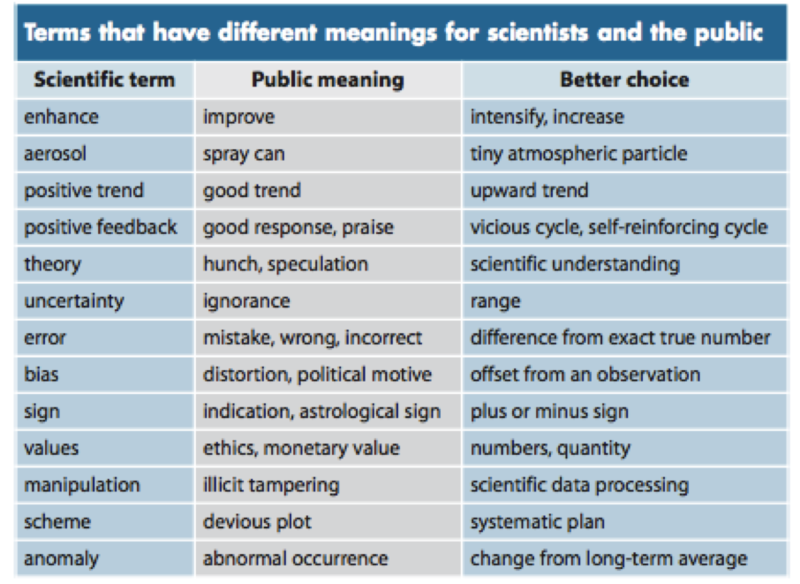 I thought this table from “Communicating the science of climate change” by Richard Somervile and Susan Hassol was an eye-opener. Instead of jargon, scientists should find metaphors that bring concepts to life and help readers get an intuitive sense of the science. A spot-on metaphor or figure of speech doesn’t exclude readers, but like jargon it quickly conveys a complex concept. Zimmer pointed out, “our brains are built for metaphors”. To avoid “in-speak” scientists need to place themselves in the mind of a non-scientist, which requires a forgetting of sorts. Think: what did words mean before science colored them? Zimmer keeps a running log of banned words in science writing that you can refer to. I’m guilty of relying on “forbidden” words like modulate and elucidate, among others. Zimmer said he’s noticed that jargon is leaky, often seeping out into surrounding sentences. That is, scientists tend to write in overly formal language. A real-life example he used was the graduate student who wrote that flu spreads in “household settings”. Another bad habit of scientists is that they often use the passive voice. I think this happens for two reasons: 1) scientists are typically modest and sometimes feel like saying I or we did/found X sounds arrogant 2) scientists aim to be unbiased; when the passive voice is used in scientific articles it’s as if to say “any person who followed the stated protocol would have found the same results”. However, when passive voice creeps into non-academic writing, it can leave the reader with the impression that phenomena unfolded without any apparent cause. Once a scientist unlearns his or her bad habits, the next step is to practice the craft of story building. Zimmer said that when we look at a beautiful piece of architecture, what we appreciate is how the craftsmanship at different scales work together. In writing, the craft starts with word selection and scales up to the paragraphs and overall structure of the story. 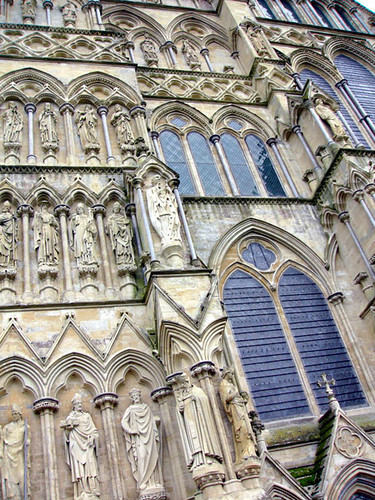 Like a building, we can take apart the elements of a story and figure out how it was constructed and what makes it compelling. If you want to learn how to write a magazine article, reverse engineer a magazine article. Zimmer said that before starting, you should be able to state your story in ten words or less. If you can’t, you don’t know what you’re writing about yet. The introduction should provide a road map for the journey you’ll take the reader on. The end of the story can look towards the future, “What are the implications if this finding holds up?” Stories, scientific ones included, are about people doing things – so bring the players to life. Also, writers should make sure to orient the reader throughout the story, especially if the piece jumps around in time. Finally, don’t be afraid to read your writing out loud. The most enjoyable writing flows naturally and takes on the cadence of speech. Scientific trainees spend much more time wielding pipettes than wielding pens. Yet, the ability to write clearly for a lay audience is vital if scientists want to inform public opinion on issues ranging from food production to climate change. At a time of looming budget cuts, scientists need the support of the public. We should be seeking to communicate how our science can improve lives, whether that means finding new energy sources or simply providing people with a “gee whiz” science moment. We might need to unlearn some habits in order to do it, but scientists can help spread the wealth of science to the public. Most scientists start with the engaging quality of enthusiasm — to get through a degree course, the PhD and all the research-council hoops, you would need it…Enthusiasm is infectious, but to command an audience of readers, scientists should exploit their other natural gifts. One of these is training in clarity. Another is training in observation. And a third is knowledge. I’ll keep these words in mind as I work to put Zimmer’s writing advice into practice. Why a promising experimental result is like a new boyfriend. There may have been others before you, but I can you tell this time is different. You won’t deceive me, and what I’ve found in you will be true. You won’t be like the others, who raised my hopes and had me planning for a future together. A future that was never realized. The follow-up experiments that were never performed, the papers that went unwritten. And I admit it. It was my fault. Prematurely, I placed significance on relationships that were new and uncertain, that hadn’t yet been tried and tested. I did this because I wanted so badly for each one to work out. My heart swelled at the slightest suggestion of a correspondence between my deepest hypotheses and desires and my experimental results. I wanted to find meaning in it all, to know that all of the time and effort I had invested in the lab wasn’t in vain. That my work would lead me to that feeling of discovery that happens when you find the right one. The one who opens your eyes to new possibilities and forever changes the course of your thesis project. But I’m not a first year graduate student anymore. I guess you can say I’ve built up my defenses. I don’t fall so easily. They say that love is blind, and you know what – it’s probably best that the experimenter is too. Still, that didn’t stop me from getting butterflies the first time I saw you. But this time I kept my cool. I took my time getting to know you. I checked that you were consistent, saw how you behaved in different conditions. I made sure that you’d stick around before I ran to tell my labmates about you. And now I can say that I think I’ve found the real deal. This relationship looks like it’s too significant to fail. My n is high and my p value is low, and this time, baby, I think we’re going to make it.